Step 1- My first plan of action after experiencing everything we did in Peru, is to be grateful for eveything I have and all the amazing things given to me. From experiencing the hardships of life in the slums, we can only become appreciative to all the material things we enjoy in our everyday lives. Being grateful for all these things is an important action step. From a newly founded understanding of why I should be so grateful, I can begin to understand my role as a global citizen and how I can make a change, big or small. Step 2- Because I have been blessed growing up with familial wealth, while being humbled through my appreciation, I plan to travel to other parts of the world to experience how life varies/similar to life in both Peru and the United States. Doing this, I will only become more aware and create a better understanding around the importance of being a global citizen. Becoming a more well rounded global citizen by traveling will postively affect my understanding of my role and begin to act upon it in order to make a change within the world. Unlike we necessarily were able to do in Peru in such a short period of time, making a postive change I believe can be done by traveling to understand how life is different eveywhere you go. Step 3- The past two summers I have been apart of a great organization called the Sanneh Foundation, that gives underprivileged kids a safe place to go during the day and enjoy life through the game of soccer. 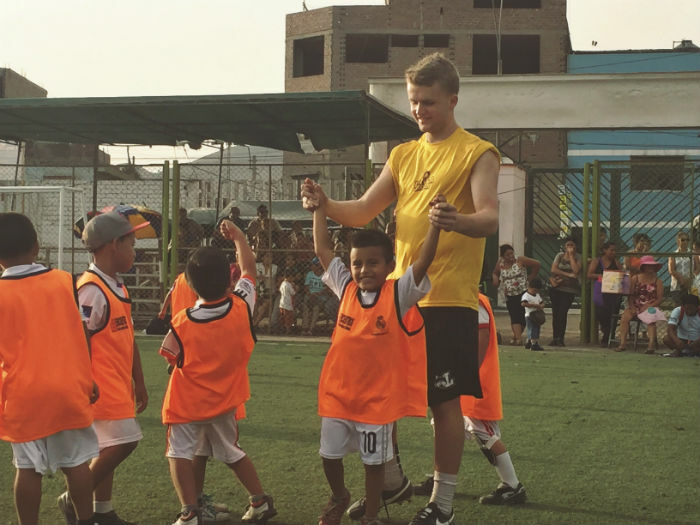 Similarly to what we did in Peru, soccer is an escape to all the hardships of life that a kid may be dealing with at home. Being apart of the Sanneh Foundation, I am a coach that gets to not only teach the game of soccer but create an environment for the kids to enjoy but also create personal relationships that I believe in result made the kids feel "loved" in a way. A big role we played in Peru, was our capablity of making kids smile and ultimately creating happiness. I will continue to be apart of the Sanneh Foundation because it gives me a sense of contentment, being able to see the postive affect you can have on individuals.